KG: What do you look for when you blog a model, how much do you consider the builder when making your decision of what to blog? MH: I like to see clever techniques in a model: not something that is only applicable in the specific build and makes the masses shout “NPU”, rather something truely useful that I (and you) can apply to a future build. I like to see a model that is “clean”. I much prefer a smooth build that is borderline boring to one that is super busy and aesthetically overbearing. A good example of what I look for is Danny Rice’s big blue SHIP from 2006. He achieved clean lines while still having an appealing overall shape with lots of interesting details. Das Newton is also really good at that, though his is a little busier. His builds are still really great. I take a lot of consideration with regards to the builder when I am blagging. I like to find new builders; variation is a wonderful thing. 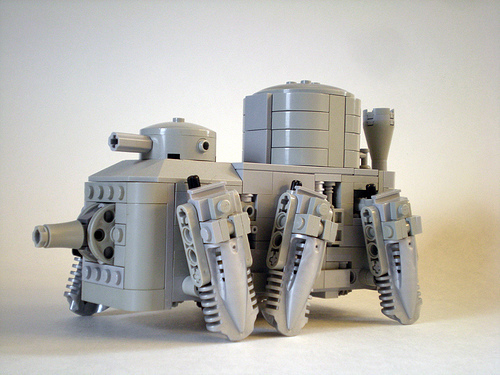 Pickyourownbogie is a great builder who has recently joined flickr. Look him or her up. I would get boring if I blagged the same builder over and over, so I try not to. I would lose my vocation and audience (more so than I already have) if I only blagged everything in mijasper’s “TnT” folder even though it all deserves the attention. KG: Compare and contrast a Train show like NMRA with a Lego convention, do you prefer one over the other? What is the most ridiculous/odd thing you’ve seen at either? MH: Public days at fan conventions are pretty comparable to a model train show. There are lots of rabid kids grabbing things and asking the same questions and aloof parents. Unlike fan conventions, some model train shows will actually pay for a club to be present, but mostly just to cover expenses like gas, food, and sometimes a dingy hotel room, depending on their budget. Model train shows are also different in that they are solely public days. Obviously you socialize with your club mates, but rarely with AHOLs outside of your club and there aren’t activities afterwards. One exception was when I went to the NMRA national train show in Detroit in 2007. It was my first real life experience with fans outside of my club and was like a small convention for trainheads that happened to be at a convention not organized by AHOLs. It was a nice blend of the two. After attending a fan run, Lego-centric convention last year and this year, I think I prefer them. Last year I bunked with five other AHOLs in a hotel room for two and this year I got to stay with a local (thanks again, Dave). Both experiences were great and I’d like to have more in the future. The most ridiculous thing at the fan run convention had to have been the organizer, drunk, singing a Jimmy Buffet song and telling children to “get the *expletive* out” of the convention hall because it had become an adult only event. The dozens of AHOLs drinking Corona Light out of Pick-a-Brick cups made it stange too. The strangest thing at a train show was probably when a mother started to yell at me when I scolded her child for picking up one of my train cars while it was running around the layout, dropping it, and breaking parts that are no longer in production. KG: You’re a regular contributor for twee affect, sometimes called the sister-blog of TBB. Talk about how you came to write for the blog and the philosophy behind ‘every smile is a lie’. Was the blog started as a reaction to TBB? MH: Kevoh started the blog a few years back and I think I asked him if I could start writing for it too. We didn’t like what we were seeing elsewhere and thought our opinions mattered so we were pretty active for a few years, trying to promote our ideas. I think my first post was an angry rant about some 8 wide trains that were getting a lot of what I thought was undeserved attention. A lot of my posts were really, really dry and made obscure jokes that I don’t get when I go back and look at them. It must be really alienating. Kevoh and I got three other people to start to write for the blag, but they are not as active, so I enlisted the help of Erik F. (lemon_boy), who is as great of a builder as he is a writer. It’s hard to believe he’s so young at times. I don’t remember what we originally meant for “every smile is a lie”; make it mean what you want or think it should mean. You control the action, as they say. KG: You’re probably one of the youngest Train builders out there, surrounded by silver-heads. Is the genre doomed as the baby-boomers die off, or will there be some kind of renaissance? MH: There is definitely the fear of model-railroading dying out among traditional model-railroaders, but I think my generation will keep building Lego trains. We have the advantage of having the theme be more widely available than it originally was (trains used to not even be distributed outside of Europe). There are some great and promising young train builders other than myself. Technoandrew is the first one who comes to mind. There’s a young Dutch builder who’s also in college who comes to mind, but I don’t remember his screen name. He’s been working on an iconic Dutch locomotive for a while that’s really well done. 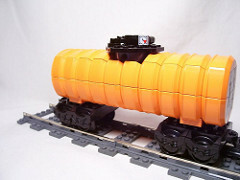 Erik F. (lemon_boy), a fellow twee affect blagger, is also into trains, but does not build traditional prototypes. His stuff is really good. Gerrit Cartensen is also good, but he has not been active for a while. 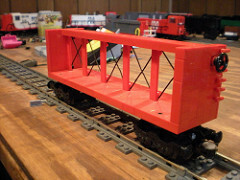 Railbricks featured an article on young train builders a few years ago. KG: Do you think we’ll ever see an American Lego convention without a public day? What’s your take on public days in general? Do you think exhibitors bear any responsibility beyond just watching their models to prevent theft? MH: With the current model of fan conventions, public days are a necessity if they are to keep being run as they are. I don’t know all the logistics, but renting a hotel convention hall is expensive and fan registration probably doesn’t cover all of it. It would be nice if they were not run for profit, but it takes a special kind of person to do that and would probably never happen in our small community. Giving fans perks like discounts at the nearby Lego store helps offset being exploited for the profit of the organizers; other perks (read: food) would be nice. Like I said earlier, public days at conventions are pretty much the same as an entire model train show, so I am used to dealing with the public and don’t mind that much. I would much rather hang out with people whom I only talk to on the internet for a few more hours, but public days are also great ways to reach out to adults who are not yet fully in the hobby who might be interesting people who can contribute in their own way. It’s cheaper to go to a public day and test the waters than to pay full registration and find out that you don’t like these people at all. A lot of people in my train club (including myself) joined because of seeing the club’s exhibition at a public event. Event organizers have a responsibility to prevent theft. They rely on fans to provide them with the content that draws the public in; it shouldn’t be too much trouble to be more watchful or hire extra sets of eyes to watch over the event. KG: There is photographic evidence that your first Lego set was the Exploriens Planetary Decoder, so what went wrong with the Train obsession, and will you ever embrace your heritage in the stars? MH: I don’t know went wrong with me. I had lost many of the pieces of that set from moving so much and being a careless child so a couple of years ago I bought that set on Bricklink for the sake of nostalgia. It didn’t change things and I took the set apart a year later because I needed the finger hinges for something. 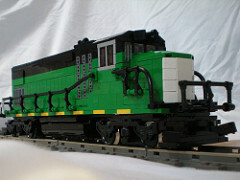 I have always been a little interested in trains, and my interest really picked up when I joined my train club in 2006. 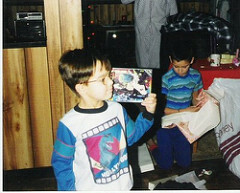 I had other fans to talk to about Lego and trains; they enabled my transformation. I don’t know if I will ever go back to my roots, but I will continue to build Steampunk (I prefer to call it Tweepunk to distance myself from people whose stylistic choices differ from my own). For a while I’ve been trying to make a Tweepunk train, but it is heavily dependent on Bricklink orders, which slows the process and makes me lose interest. I really like what Tromas does with MaK, and would like to dabble more into that. MH: I would enshrine my Burlington Northern GP9 in the great FOL Time-Capsule. It is about 4 years old, but I still have it together and it doesn’t look out of place with the trains that I also still have put together. It is what I see as the turning point in my style. It has a lot of techniques which I still use today. MH: Boxcars. I build a lot of them and most are legal enough that I would not have to compromise too much. 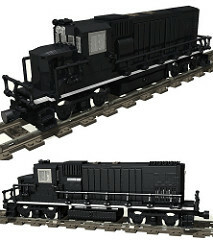 There aren’t Lego sets anymore that are just freight cars, so there has got to be a demand. A majority of my boxcars are built upside down, so having kids do that would give them a different perspective on how they put their own creations together. MH: Adrian Florea and mijasper. Both have really iconic styles that would contrast well with me. MH: Noam Chomsky. Not Noam Chomsky the anarcho-syndicalist, Noam Chomsky the linguist. His transformational grammar theory is super complicated so it makes me think he would be really good at the kind of overcomplicated, not-achieving-much SNOT that I do. MH: Google controls the action.